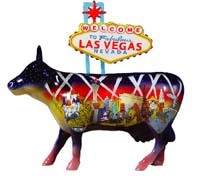 Welcome to Fabulous Las Vegas | CowParade Retired Figurines | One Price Low Flat Shipping! From the CowParade Retired Collection, Welcome to Fabulous Las Vegas. Designed by artists, John Main and Jim Severson. Featured at the CowParade Las Vegas 2002 exhibit. Made of ceramic. Measures 4" x 6". New in original box. 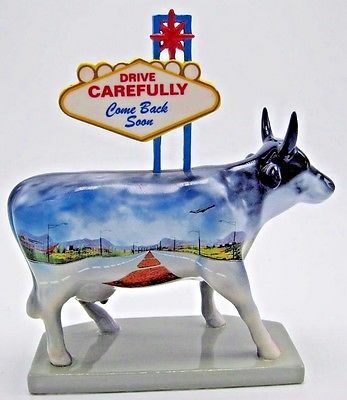 This collectible cow figurine features the famous desert sign, Welcome to Fabulous Las Vegas with the scene of the long open road heading toward the desert mountains on one side with the sign reading, "Drive Carefully, Come Back Soon." The other side, shows the strip with the casinos and bright lights and all the energy that going with being in Vegas, and the iconic sign reads, "Welcome to Fabulous Las Vegas."